As your child grows he/she start becoming curious, adventurers, start exploring, touching and moving everywhere in the house. At this stage, mom worries too much because anything in the house becomes a danger to your child. To ensure your child grows in a safe environmental baby safety products are the most essential products you must have. The excellent news, technology has provided with different baby proofing products to install in various areas in your house. If you read this article from beginning to the end, you will learn Top 50 Best Baby Proofing Products 2019 that every home must have to keep your little one safe around your home and while on the go/ home. Today’s world’s Stay-at-Home Moms is a busy mom. Thanks to the technology, they not only attend house chores and look after their children but there are jobs they can do online or business to run while at home. Every stay at home mom (if you cannot afford a house help or daycare) will agree with me it’s not easy to attend to house chores, work online, manage your business, and all the same, supervise on your kid safety and provide your baby with the comfort needed alone. But technology has made it easy by offering us with best Baby Proofing Products that will make moms life easier. Even though the economy is growing fast and life is becoming tough, we are forced to put jobs more important than our family. But with all those challenges, nothing in the whole world is more important than the safety of your baby. Mom who has a small kid will agree with me they experience a moment of fear. For instance, when your child is playing outside you keep on checking to make sure the baby is safe, you even check what is around that can harm the baby. Also, when a baby is asleep (especially if a baby has a long nap), most mom rush at the bedside to make sure the baby is still breathing or the baby temperature is okay. The funniest thing even when your child is grown you keep on worrying. You remove all the baby hazards to make sure your child is safe. But the reality is as your kid grows he becomes curious, likes exploring new things and become adventurous. They are fond of putting things in their mouth, play with hanging electricity gadgets, play with door locks and cabinet doors. Even the simple thing in the home becomes a danger to children. Mom should not worry anymore along with keeping your environment safe and proper supervision you can work at home with peace and keep your baby safe by installing Baby Proofing Products like cabinet locks, corner cushions, and socket covers. With that in mind, there is one problem finding the Baby Proofing Products to buy in 2018 is not easy. That’s why I’ve shortlisted a list of Top 50 Best Baby Proofing Products 2018 that will protect your child and help moms attend their duties with peace of mind. If you are buying safety product for crawling child, or as soon baby starts to walk. At this stage is when you require most of the guard products since the baby has begun to become an adventurer. Once your child starts roaming, you will realize how hazardous your house is. To prevent your child from danger, most parents install best baby gates to potential danger zones such as stairways, fragile decoration, fireplaces, and glass furniture. Also, parents place gates to playroom and exterior doors to keep play areas safe without closing the main doors. Surprisingly most parents find it difficult to get the best baby gates. That why I’ve prepared the guide to help parents to choose the best baby gates. Distance –you need to be accurate with what distance does your child gates need to cover. Locking mechanisms – Avoid gates with the simple opening mechanism. Make sure you buy a gate that will give you another year before your baby figure out how to open it. Height – since kids are adventurous find gates that can discourage your child from climbing. The height should be at least ¾ of your child’s height. Baby gates must be at least 22 inches, and the distance between floor and gate should be 3 inches. The best thing most gates are as high as 39 inches so the higher, the better. Sturdy – babies will try to push the gate, lean on it, and climb on it. Make sure if it is wooden gates has smooth surfaces and has rounded edges rather than square edges. Also, check the label that the gates meet the certain safety standard. The gate that you can open with one hand – you might be carrying a baby, laundry basket or carrying grocery. The last thing you would no like is to put them down to open the gate. Find the gate that can be easily opened with one hand or easily opened by foot. Where you are planning to put the gates – some gates are best for doorways, others stairways and in between the rooms. So where to put the gate matters a lot get the right type of safety baby gate for each position of your home. Door width – if your door is wider than 31 inch then you will need a baby gate that will accommodate wide doors. Some gates come with extension others do not. Easy to open – Most of the injuries caused by safety baby gates involves an adult who falls when trying to climb over to open. So make sure you buy baby gate which is easy to open so that you won’t be tempted to step, jump or climb over. Note choose baby gates that are certified by the Juvenile Products Manufacturers Association (JPMA). Hardware-mounted gates are installed by drilling holes in the walls then you fix using metal or wood screws. Hardware-mounted gates are best gates for top of stairs and fireplaces. 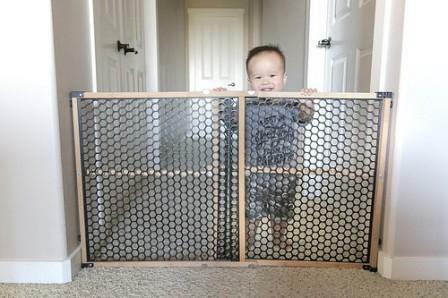 Hardware-mounted gates are most secure baby gates since are supported by the house. They are pressed on opposing walls. It eliminates drilling holes in the walls. They are best for the bottom of stairs or between rooms, so they are not best for stairways. Portable – easily moved from one place to another. Can be used doorways, hallways, the bottom of stairs, kitchens, laundry rooms, bedrooms, and playrooms. It’s best for door openings and stairways. Its door closes and locks automatically after walking through. Finally, there is no gate assured to be childproof never leave your child without proper supervision. if you did find the baby gate you wanted from our review you can find more here. Every mom’s worry is the safety of her children. When your kid starts to stand and move independently, they are capable of falling either to sharp edges which leave them with nasty cuts. At this stage, it becomes harder for moms to control. The only solution to prevent your child from danger and risks is childproofing your home. Best baby edge and outlet guards are one of the protectors of your child if you want to keep your home safe for your child once they start moving around. Also, they reduce risk to any sharp and angled edge in the area such as glass tables, countertops and coffee tables. Soften the sharp edges of your glass table’s, countertops and coffee tables by installing edge and corner guard. With that in mind, I’ve prepared a list of Best Baby edge, and corner guards must have. The Hamptons Baby is the corner protector which comes in a set of 8 and is clear in color. They are best installed on plastics, metal appliances, wood desks, coffee tables, kitchen counters of tile and stone. Roving Cove is extra long Safe Edge and Corner Cushion which covers the 16.2ft surface area comes with 15ft edge cushion and four corners cushion. Roving Cove is coffee in color which goes well dark brown-colored furniture made of mahogany, oaks, cherry, and walnut. The Roving Cove is one of the purest cushions available since it does not add toxic flame-retardants so contains No BPA, no phthalates, no heavy metals, no latex, no SCCPs. The Roving Cove is inherently flame-resistant; passed flammability tests under US regulations. Cabinets, drawers, and cupboards not only give your house a stylish look, but they also make our homes look organized. Without them they make our houses look untidy. I don’t think when we are installing them in our home whether there is anyone who thinks it as a danger zone to our kid we only think them as the safe area to keep our documents, keep medicines, poisonous substances sharp objects in the kitchen and other storage purposes. I don’t think when we are installing them in our home whether there is anyone who thinks it as a danger zone to our kid we only think them as the safe area to keep our documents, keep medicines, poisonous substances sharp objects in the kitchen and other storage purposes. As you know as the kids grow they become adventurous they play with door and cabinet locks. Those doors and locks can be shut on your child’s finger causing damage. Kids like putting a thing in their mouths what if your kid opens the drawer, find poisonous substance or medicine and take. That’s why we need to baby proof our cabinets, drawers, cupboard and locks to prevent our kids from risks. 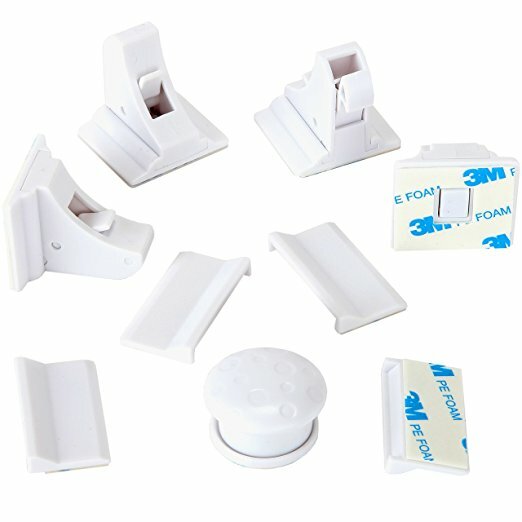 Munchkin Xtraguard Dual Action Multi Use Latches is used to secure cabinets, drawers, appliances and toilet seats. It requires a dual button to release making it hard for children to open but easy for an adult. The lock is easy to install with provided adhesive and easy to remove without damaging the surface. Made of flexible straps, which allow the lock to latch around corners. With ultra strong 3M adhesive makes installation easy and quickly without the use of any tools. The lock is made in appealing and unique designs with colors made to match your home decor. 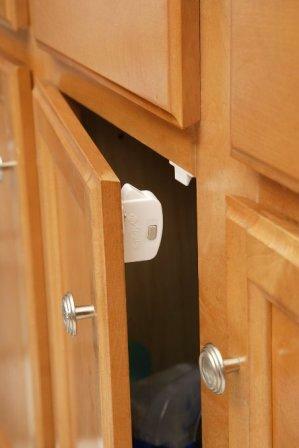 This one of the cabinet locks that is easy to install you don’t have to drill or screw to fix it. A magnetic cabinet lock pack consists of multiple locks and one key. You can fit in different cabinets and use this one key to open. Keep that one key safe. When you don’t need to open or close your cabinet more frequently, you can deactivate the switch to put off the lock and later activate the switch back to on, and it will close immediately. 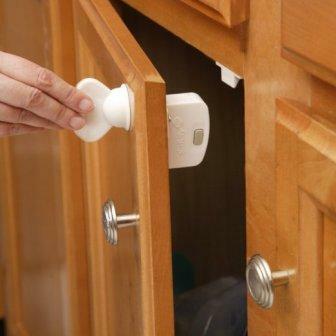 Safety baby magnetic cabinet lock is mounted inside the cabinet; it will not open unless you open it using a magnetic that the baby cannot access the lock. You don’t have to drill into the cabinet; the lock has 3M adhesive tape which makes installation easy. It can also fit any cabinet style and keep the children safe without giving up home appeal. The cabinet locks are designed to work only on a cabinet with side by side knobs. It adjusts to secure knobs up to 61/2 inches apart on center. 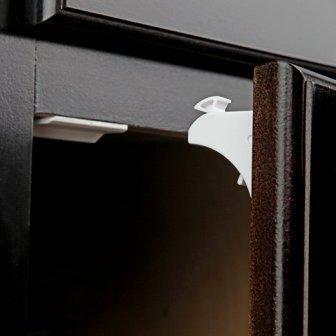 Kiscords cabinet locks are available in black and white colors to match any décor. 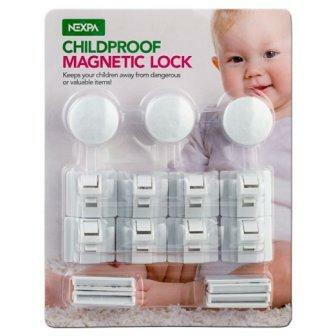 They are perfect for baby proofing kitchen, bathroom, and furniture. Sliding locks require no installation you only push down and lock tight against the handles. Looking for an outlet cover that closes instantly after a power cord is removed, Safety Baby Self-Closing Outlet Covers is an alternative cover for you. They prevent children from tampering with the stove controls. Safety 1 stove knob comes in a count of five and is clear designs blends in any style décor. The universal size that makes the knob to fit almost all oven knobs. The knobs have non-adhesive mounting. The covers are sturdy, reusable, removable, heat resistant and feature hinged lid for quick adult access to the stove knob. They feature hinged lid for easy adult access and comes in the pack of five. It comes in charcoal to compliment today home décor trend. The bath spout cover brightens up the bath while keeping your baby’s head safe from the bump. The skip hop Moby bath spout cover has adjustable straps that secure and tightens on most spouts. It has a tail that hangs neatly when not in use. The spout cover is BPA, phthalate- and PVC-free dishwasher-safe, mildew and mold resistant. This bath spout cover is easy to clean, dishwasher safe, BPA and PVC free. The Munchkin Bubble Spout Guard has adorable blue elephant design that has adjustable strap makes it easy to fit faucets and accommodates shower diverter. The spout cover is made of soft and tough silicone (rubber) which is BPA, phthalate and PVC free making it safe for your baby. Features adjustable fin that makes gadgetmine spout cover secures and tightens most faucets. The gadgetmine spout cover hides the shower diverter entirely or accesses it from the top. The curved seal tail can be used as a hook to hang it when not in use. The bathtub mat is extra long size 40x16inches provides excellent coverage for a home gym, bathtub and spa. It is made of high-quality allergen-free vinyl, which is BPA free, anti-bacterial, and machine washable. This bathtub with over 200 suction cups provides effective slip resistance in the bathtub or shower. This product features 324 Gorilla grip suction cups that help hold in place on smooth clean surfaces. The extra generous sized is measured 34×16 inches covering most of the areas in the bathtub. Features small holes throughout, allowing water to circulate therefore prevent Gorilla bath and shower mat creating a moist underside. The skip hop Moby bath kneeler is made with quick-dry neoprene which you can hang to dry on towel bar or a shower rod with straps. This product is size 17wx11Hx1.3D w a large and cushy bath kneeler for your parent comfort. Non-slip backing and the cushion padding stays in place without skidding or give parent achy knees a rest while baby enjoys bath time. The Skip Hop Moby Bath Elbow rest features non-slip backing, cushy foam padding, and a water-resistant handy pocket for safekeeping small items. Place the elbow rest on the tub edge it secures with suction cups and hangs to dry after use. Comfort your both elbows and knees using Baby haven Premium Bath Kneeler and Elbow Rest during bath time with your little ones. This product features cushioned elbow rest that is thick padding, six strength suction cup that locks, pad in place, pocket for storage purposes and is a size 22 inches wide. It also has large non-slip knee pad that is 22 inches wide and non-slip rubber base that grips to the floor. The bath kneeler and elbow rest mount on the tub when not in use and has handled for hanging. It comes with the handle, Velcro and zipper storage bag that provides multiple storage options. Prevent your baby from repetitive flushing using toilet handle lock. 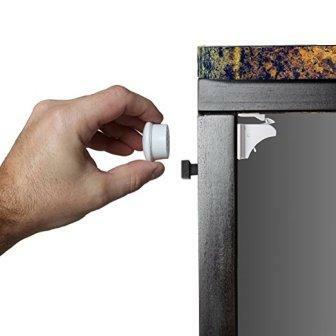 The flush stop toilet handle lock installs in seconds using impact resistant 3M adhesive. It fits most standard toilet and custom handles. The lid is easy to open with simple one hand operation. No adhesives and tools are required to assemble. The product should be used on lids and seat rings ranging in size from 2 inches and 2.5 inches. It also fits on toilet bowl rims ranging in depth from 1.25” – 3” A large “L” shaped bracket and a small “L” shaped bracket are included for adjusting toilet bowl rim fit. Features easy to use adhesive, so no drilling is required. The toilet lock automatically relocks when the lid is lowered and has a SecureTech locking indicator that will help you know if the top is locked or not. Prevent your kid from opening doors or getting locked in the room. These doorknob covers are white, has a subdued and unobtrusive design so they can blend with your door. Jool baby door knob cover is compatible with standard spherical doorknobs. The munchkin door knob cover has sculpted design that ensures a secure fit to surfaces. The package includes two knob door cover. The ergonomic design with locking geometry wraps around the entire knob providing strong tamper resistance. The doorknob fits most standard door knobs. The sleek design blends in with home décor. 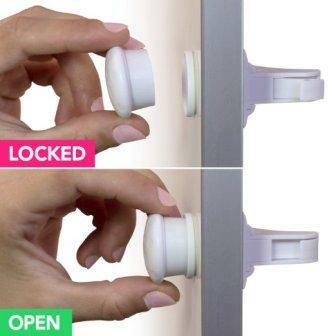 The package includes five white pack of KidCo doorknob lock that is either white or clear color. The knob lock has unique side pinch-grip design and fits standard style door knobs. It is easy to snap together installation. Baby monitor, -keeps an eye on your child while you are in the different room or outside attending some activities. Protecting your little one while traveling or on the road is very important. The research done in Kenya has shown two out of 10 people involved in a road accident are children below the age of 10. This has forced the government to come out with rules to address the measures of protecting your little one while traveling. The government not only set rules but creating awareness through campaigns focusing on parents, caregivers, and guardians sensitizing them various ways of protecting your child from accidents. One of the best ways to baby proof your child while on the go is installing a car seat for your child depending on age, height, and weight. In addition to car seat, a study done in the UK revealed that if children travel while fitted on the right car seat, it will help reduce the loss of your little one lives in a road accident by 60%.